The Featured Post extension adds the ability to display a specific post based on it’s ID. This allows you to display any single post independent of the rest of the feed. Below is an example of using the Featured Post extension to display a Facebook post by it’s ID. 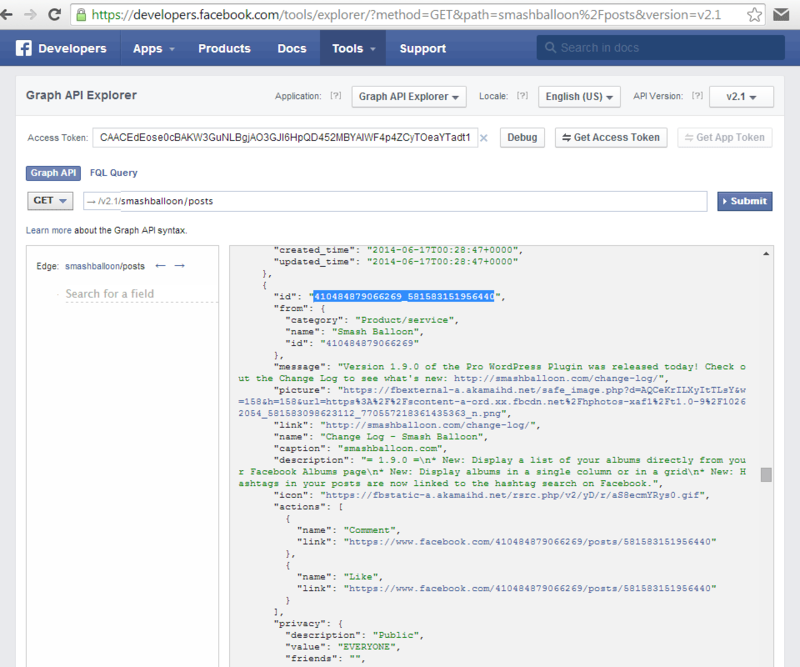 You can also find the ID of your post by using the Facebook Graph Explorer tool. Just enter your Facebook Page ID into the field followed by ‘/posts’ (eg: smashballoon/posts) and click ‘Submit’. You should then see the API feed of your posts. You can use your browser search tool to find your post and then copy and paste the ‘id’ field from that post into the ‘featuredpost’ shortcode option. A screenshot is included below for reference. In order for the post to be formatted correctly, you need to specify the type of post you are displaying. If you are displaying a photo then add type=photo to the shortcode, for example. If it’s a link then add type=link, if it’s an photo then type=photo, etc. * Due to Facebook restrictions, in order to display an event you would need to be a host of that event and also use an Access Token from your own Facebook Developer App. Please see here for more information on displaying events. * Now uses the latest version of the Facebook API. Removed any dependency on version 2.0 of the Facebook API which will be deprecated on August 8th, 2016.